Years ago, I wrote a Self Magazine story about actress Kerry Washington and her love for entertaining. She shared lots of advice on everything from how to quickly dress up a table (in-season monochromatic blooms, votive candles) to her favorite dinner soundtrack (old standards by Frank Sinatra and Billy Holliday). But the one tip that really resonated with me focused on what to wear to your own dinner party, because, of course, figuring out what to wear can be as time-consuming as the menu and table seating planning. For starters, it should be something special, an outfit that will both wow and welcome your guests and reflect the party's vibe. But Kerry pointed out that above all else comfort is key. I find this so true, and my interpretation of "comfort" is, for example, a low heel or elegant sandal, as you’ll be making lots of trips to the kitchen and flitting from guest to guest. A dress that stands out but isn't overly complicated is also ideal in my book. As Kerry explained,"I don't want to be fussing with straps or lots of buttons, but rather focusing my attention on friends." 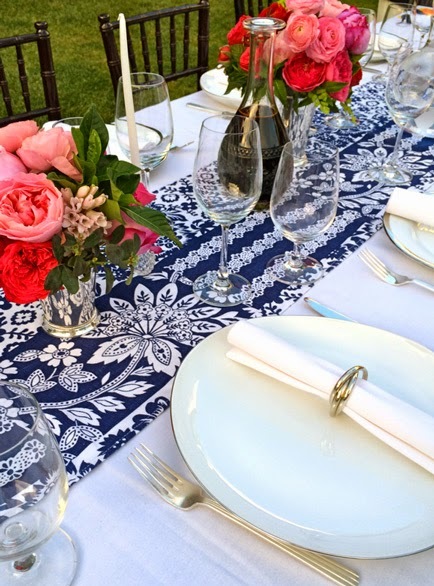 So, when I threw my first al fresco dinner party of the year in my backyard for my father in law's 75th birthday the other night (table above, with accessories from Set Sip Serve! ), I thought back again to Kerry's hostess-wear advice, factored in more of my own party wear mantras--such as add sparkle, lean toward loose, easy and flowy, and incorporate head-turning accents--and sought out some spot-on fabulous looks. My faves include this striking scarlet-hued Tibi, sparkly Needle and Thread mini, this sleek Jay Ahr, this embellished Issa shift, this easy Helmut Lang jumpsuit, this cute ruffled Tambourine, this effortless Karl Lagerfeld maxi and this print-happy Peter Pilotto. All of which, I think, will help me look more like a relaxed and unflappable hostess--the kind who perhaps kicks her shoes off before dinner is served and doesn't flinch even when a guest is late! Looks like a beautiful party -- you are a nice daughter-in-law! I also loved the set sip serve site and will find it useful. Thanks so much!